Introducing Abi from somethingaboutbaby.co.uk . Legal PA by day Mummy Blogger by night. Abi enjoys writing about the more gritty side of parenting and is more than happy to join in a debate when she has a passion for the subject. Do check out her Tree of Life blog post. 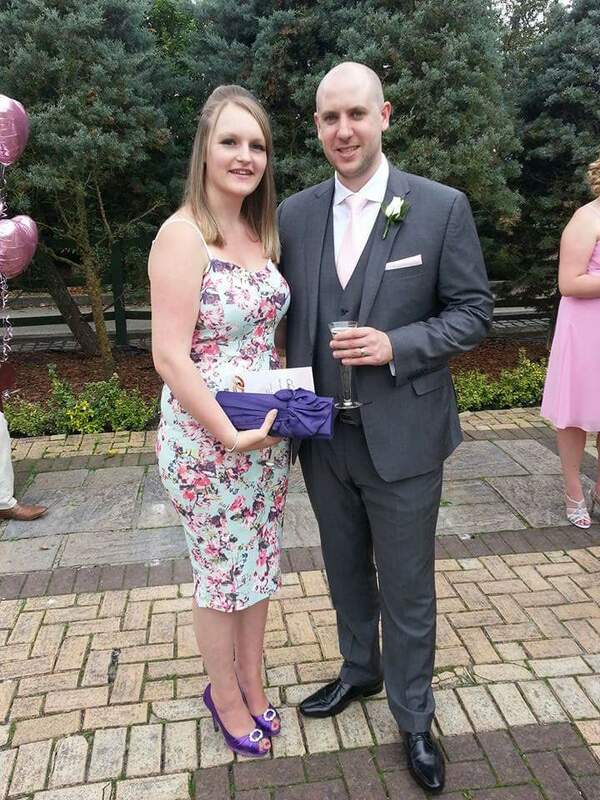 So without further ado over to you Abi ……..
My name is Abi and I am married to my childhood sweetheart Craig, who I will have been with for 10 years this year! We have created a beautiful little family with our son Alfie, who was born last summer. I have just returned to work full time as a Legal PA in the City, but I continue to blog in my limited spare time that isn’t taken up by Alfie. Since becoming a mum, I have learnt more nursery rhymes than I can count, and can now recite the Mr Tumble, Mr Bloom, RaRa, Paw Patrol and Let’s Play theme tunes off the top of my head! This dress was made notoriously popular last year on a facebook group because of the ability to breastfeed in it, without it being a nursing dress. It’s from Boohoo and only cost £20! I love this outfit purely because of how good it makes me feel about myself. This photo was taken 6 weeks after I had Alfie, and this dress made me feel amazing – it fit well, was stretchy enough to cover any lumps and bumps and also easily accessible for me to pump as I was away from baby for a few hours. It was the first time since having Alfie that I had got dressed up nicely, and it felt great! So now whenever I wear it, I remember that feeling so I always feel good in it. 2. How often do you get to go on nights out? Not as often as we’d like, but it’s not because we’re short on babysitters – all our friends and family are great at offering to have the little one, I just feel bad about leaving him. We have been about maybe 4 or 5 times since he was born last summer. We used to go to the theatre in London a lot before we had Alfie, but we haven’t been able to go since he was born, so I’d love to go back there. Our favourite place to go on a night out is usually the cinema – we love our films! 4. How much do you normally spend on an outfit and where do you like to shop? As little as possible as I love a bargain! I try to spend less than £50 on an outfit. I rarely buy new shoes, as I tend to find a pair that are comfortable that go with everything and then I wear them to death! I love ASOS and Boohoo for dresses, and Next and New Look for shoes. 5. How long does it take you to get ready? If I have time to just sit and get ready without any distractions, I can shower, wash, dry and straighten my hair and do my makeup (including false eyelashes!) in about 45 minutes. 6. What is your favourite drink? It’s been so long since I’ve had a drink on a night out, I’ve forgotten what I like. If I’m out for dinner, it’s a glass of Rose, if I’m out at a bar it’s usually vodka and cranberry or a martini and lemonade. 7. Do you have a party trick? 8. What’s the most you have ever spend on an item of clothing/accessory? I think it has to be my Michael Kors handbag. I bought it as a first wedding anniversary gift to myself when we visited New York and have used it every day for work since, so although it was expensive at nearly £300, I’ve got my money’s worth! 9. What’s your No1 tip for getting ready with kids in the house? I start getting ready as early as possible to factor in time for distractions. Our last night out we were dropping the baby off en-route, so I had to get ready with him in the house. I started getting ready at 3 pm and we were still late out the door at 6.30pm So if you start early, and do it bit by bit, you can factor in any kiddie distractions, be it a feed, a cuddle or an explosive nappy change! Oh, and that reminds me – don’t get dressed until 30 seconds before you head out the door to avoid poop/sick disasters! 10. If you could have a night out anywhere in the world where would it be, why that location and what would you do on the night out? I’d love to fly to New York for a night out – see a show on Broadway, eat dinner at a fancy restaurant and then finish up with cocktails on a roof terrace looking out over the New York skyline. We went to New York for our first wedding anniversary and it was amazing, so I’d love to go back, even just for one night! I hope you have enjoyed reading my blog series on ‘Parents Night Out ‘Feel free to leave me some comments or if you would like to take part then leave your e-mail address below. "10 Ways To Start Running and Never Stop"
"I Need Your Vote !!!!"